Our family recently flew from Denver to Dallas to see our nephew graduate from High School. He was born a month after Ben and I got married. I’m still trying to figure out how he’s old enough to graduate?! There was a huge party planned for our nephew and a bunch of his graduating friends to help celebrate the occasion. The party was so cute. Each graduating senior had a table set up just for them, to show them off and share all their accomplishments and hobbies. (There were 11 tables total I believe; and was held in a local church.) My sister-in-law tasked me with decorating the table for our nephew (he’s my husband’s brother’s son) on a very tight budget. Ben and I ran over to Dollar Tree (this is not a sponsored post!) and purchased the entire table’s worth of decor for only $38! Not bad! Not bad at all. Here’s the overall table, complete with balloon decorations and a guitar! Our nephew loves guitars, so when we found all these tiny plastic guitars (for a buck each!) we bought one of each style. They accented the card box nicely. Aren’t they fun?! And the best part? Our nephew got to keep them afterward as a fun souvenir. I found these pom-pom garlands in their school colors and draped them over the table for some fun texture. We also took a package of gold bead necklaces, popped them open, and put them all over the table. Afterward our nephew and his friends got to keep and wear the necklaces. Who doesn’t love these silly plastic bead necklaces? We love to collect them to toss in the trees while we are skiing. The funnest part of the evening? When the party started the lights were dimmed and we put a ton of glow sticks everywhere! He definitely had the brightest table! The kids had way too much fun helping to decorate with the glow sticks. Even the guitar got a makeover. Here’s the excited grad posing next to his table! I’m so dang proud of this kid. The big graduation party wouldn’t be complete without a live band. Ben’s brother and our nephew (his son) are in a cover band together, and they played a full set at the party! Well, we were all just totally melting because my son filled in for the band’s drummer who had a hurt back. It was really really cool seeing two cousins in a band together with their uncle/dad. And can I just brag for a minute about my boy? He had about 24 hours notice that they needed him to fill in, but he didn’t even find out until after we were already at the airport so he had no time to practice. He listened to each song a few times and went on stage and slayed it. He played 5 songs and another guy filled in for the rest. So there you have it! A complete graduation party for only $38! Most of the money was spent on balloons (10 balloons for $10), and the rest on just totally random stuff to help make the table festive. My favorite part of the table are the mini guitars. I just can’t get over their cuteness. We found them on the toy isle! 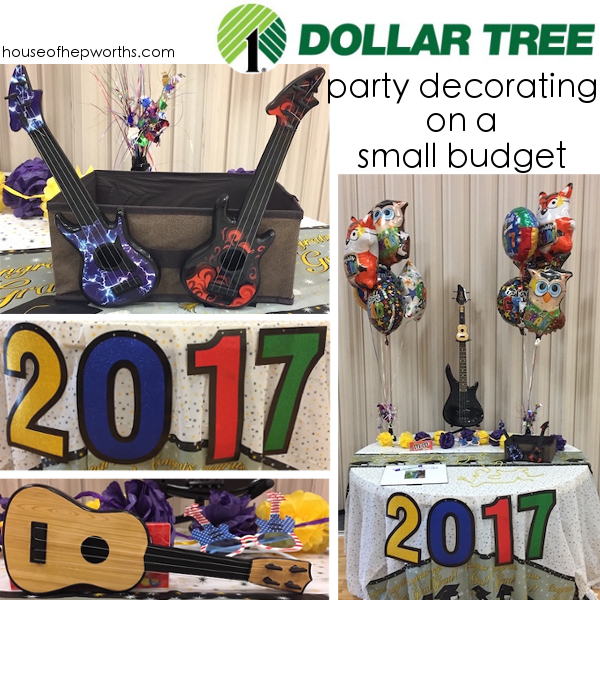 When you need to plan a cheap party, going to a dollar store and thinking outside the box (buying toys, necklaces, and glow sticks) is a great option!